Maybe if I keep blogging like it's Spring along with dressing like it's warmer out...maybe it'll actually happen? Or maybe I'm having delusions of grandeur. Either way, I feel like I ought to try. 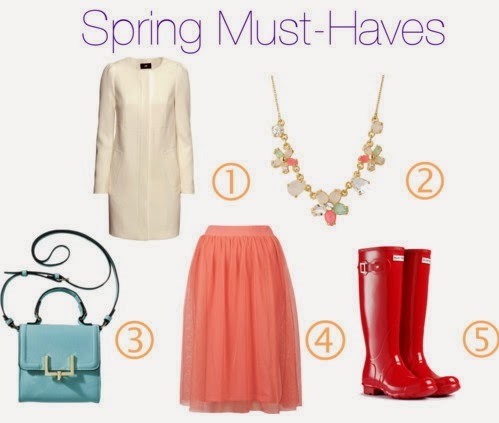 So without further adieu, here are 5 must-have items to add to your Spring wardrobe this season! 1. Structured Coat: These are great for Spring because they aren't nearly as heavy as winter coats & they pair easily in warm (er) weather with basic jeans & a tee. You can either go with a neutral color, like the one above from H&M, or you can go for a major pop of color like hot pink (which is what I elected to do). 2. Floral Statement Necklace: We all know by now about my obsession with pretty necklaces. They can instantly dress up any outfit and are perfect for any occasion. Add some flowers to one and it will be your go-to piece this season. Guaranteed. 3. Pastel Handbag: Pastels are huuuuge this season which is a great for me since I'm a pastel girl myself. I love to do little touches of pastels mixed with nudes and blush tones for some subtle color and this purse is perfect for that. Target has a bunch of great options, like the one above. 4. Tulle Skirts: Ok ok ok, I know what you all are thinking, "But Annie I don't want to look like a ballerina," and I respect that. This trend probably isn't for everyone. But keep in mind that these bad boys don't just come in pink. I recently bought a cream tulle skirt that has a much lower ballerina factor than my bubblegum pink one. If you can find a cheap tulle skirt (or even make one yourself), I say go for it. If you don't like it, you're not married to it. 5. Rain boots: These are an absolute must for the next few months. While I'm all for rain and stuff growing and whatnot, I don't like the havoc that rain wreaks on my shoes whilst traipsing about campus all day. Solution? RAIN BOOTS. They've saved my life and my wardrobe. Plus they come in cute patterns and colors! And now for an extra little treat for you wonderful readers. 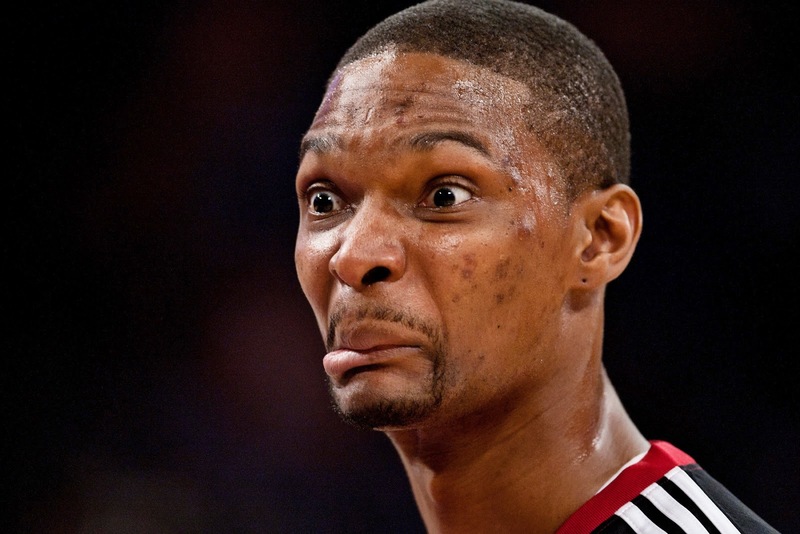 Ladies & gentleman, I give you Chris Bosh. The Jennifer Lawrence of the NBA. Husband & I went to the Pacers/Heat game last night and it was insaaaane. We had great seats and had a wonderful time despite how dirty the game was. Easily, though, the highlight for me was seeing Chris Bosh in the flesh. I can't quite explain why I'm obsessed with him (maybe it's the fact that he looks like an ostrich? ), I'm not sure. But it made me so happy to see him, even though Husband made fun of me. Here are just a few examples of why he's so great. You'll want to check out both these links, trust me. Excited For: Book group tonight! That means treats. Yessss. Should Be: Doing my French homework/cooking dinner. Hopeful That: The sun comes out tomorrow.